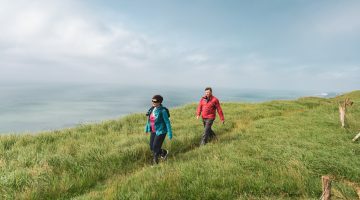 Steeped in England’s rich naval and maritime history, this stimulating 110km guided walk links the biggest city on the South West Coast Path to the ‘English Riviera’ via a wild and exposed stretch of sparsely populated coastline. 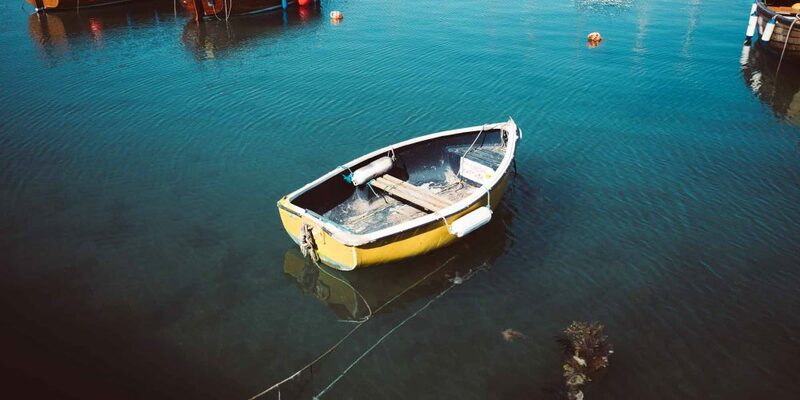 Accompanied by an experienced guide, expect to encounter all magnificent maritime scenery along the way and learn how the atmospheric old ports of Devon and Cornwall shaped our island’s history. 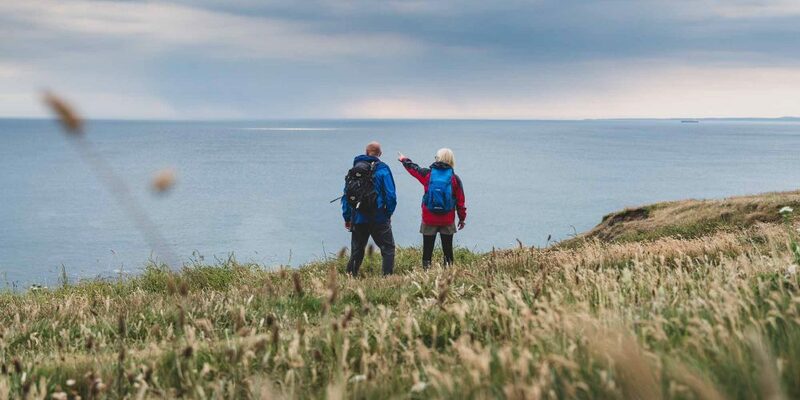 This South Devon section of the South West Coast Path is 110 exhilarating kilometres, taking your group from the famous naval port of Plymouth – from which the Pilgrim Fathers departed – to the bustling marina and fishing harbour of Brixham in Torbay. The route crosses several estuaries along the way, climbing through steep green valleys with high hedge banks carrying winding streams, and over sea cliffs providing equally varied seascapes of sand, shingle, rock shelf and clear blue coves. The landscape changes as the path enters the unspoiled South Devon Area of Outstanding Natural Beauty and onwards around the coast to the inlets of the Kingsbridge Estuary and the sophisticated port of Salcombe – famed for its regatta. After the rugged promontories of Prawle and Start Point, the trail swings north to the elegant old port of Dartmouth – home to the world-renowned Naval College where some of England’s greatest naval commanders first found their sea legs. The itinerary allows ample time to take in the wonderfully varied scenery and wildlife and taste locally sourced refreshments such as Devon cream teas, crab sandwiches and cider. 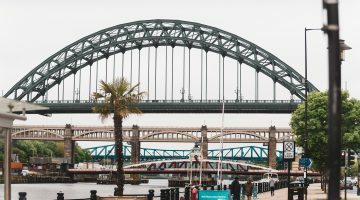 This group tour itinerary has been operated by HF Holidays – one of the UK’s largest activity holiday companies – who specialise in guided walking holidays in the UK and Europe. 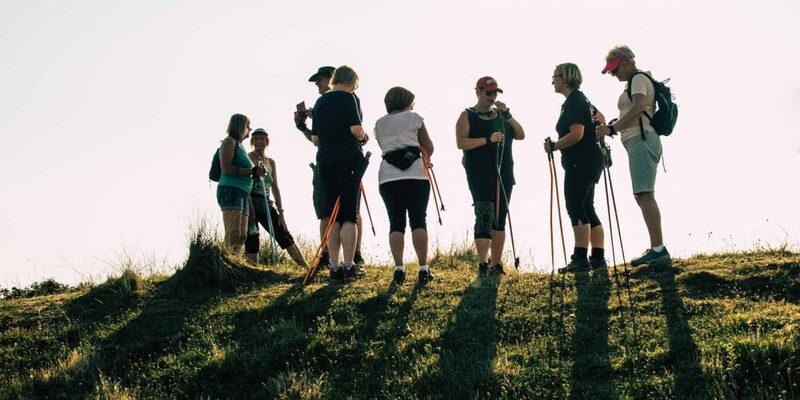 Our experienced and knowledgeable volunteer leaders undergo a thorough assessment to lead you on your Guided Trail and will also be delighted to share their knowledge and enthusiasm with you. Your trail leader will carry all the necessary maps and guides. This undeveloped stretch of coast provides a mixture of easy, high open walking and some fairly strenuous climbs up and down steep slopes and steps to reach beautiful coves. The daily distances vary and some involve several hundred metres of ascent and descent, so don’t underestimate the time/effort required. Check in at The Invicta Hotel, where you will meet your trail leader prior to your evening meal for a welcome meeting. A walk along the coast overlooking Plymouth Sound to Wembury (Warren Point), then a short ferry crossing of the Yealm estuary before climbing gently to Revelstoke Drive: a nineteenth century engineered carriage ride used by royalty. 19km / 11 miles with 1475ft (450m) of ascent and 1350ft (370m) of descent. Today we begin along an isolated and hilly stretch of coast path to Meadowsfoot Beach. Crossing the mouth of the River Erme on foot at low tide to Wonwell, we continue around and over Beacon, Hoist and Toby’s Points. This section includes some of the steepest and most dramatic sections of walking before ambling into Bigbury. 17.5km / 10.5 miles with 2,300ft (700m) of ascent and 2425ft (780m) of descent. From Bantham, we walk beside the River Avon then on relatively busy paths past South Milton Ley reedbeds to Hope Cove. Traversing reconstructed or diverted sections of the Coast Path , the trail climbs to the dramatic heights of Bolt Tail and Bolt Head. The walk ends along rocky then wooded paths above The Bar and into the yachting town of Salcombe. 21.4km / 12.3 miles with 1475ft (450m) of ascent and 1505ft (470m) of descent. Taking the ferry from Salcombe’s Jubilee Pier to East Portlemouth, we follow the Coast Path south through Mill Bay, then east to Prawle and Start Points, before heading north to Beesands. Most of the walk fringes fertile raised beaches backed by ancient cliffs of some of the oldest rocks in Devon on one of the most dramatic and rocky stretches of the Path. 20km / 12.5 miles with 1510ft (460m) of ascent and descent. From Torcross we follow the Coast Path north along Slapton Ley and on past Strete and Stoke Fleming to Dartmouth. We pass our hotel at Stoke Fleming with three miles to go, before entering our last and arguably most dramatic estuary: the River Dart and passing close to Dartmouth Castle. 16.4km / 10.2 miles with 1300ft (400m) of ascent and descent. Today we start with a ferry from Dartmouth to Kingswear, then follow the Coast Path out of Dart Estuary east to Scabbacombe Head and north to Berry Head then onwards to Torbay for pick up at Brixham Harbour. This is one of the classic walks of England. 18km / 11.2 miles with 2490ft (760m) of ascent and descent. Invicta Hotel (2 nights), Plymouth. Contemporary, light and airy interiors meet Victorian elegance at the Invicta Hotel which is located on Plymouth Hoe. Rooms have complimentary toiletries and high speed WiFi, tea and coffee making facilities, and Smart HD TV. This 500-year-old country house sits in the heart of the South Devon countryside. Room amenities include tea and coffee making facilities, ironing board, hair dryer, TV and free WiFi. This family-run hotel sits in the South Hams Area of Outstanding Natural Beauty and is right on the coast path. Stoke Lodge Hotel provides use of their swimming pool and games room. All rooms are ensuite, and offer TV, tea and coffee making facilities, and telephone. When you change from one hotel to another we will arrange for your luggage to be transferred for you. This is included in the cost of your holiday. Fly to Bristol or Exeter then train or bus to Plymouth. Plymouth is easily reached from London as it has a mainline train station and a large bus station serving much of Devon and Cornwall and regular buses to Wembury. For timetable information, visit Traveline or phone 0871 200 22 33. This tour starts in Plymouth and the hotel is a short taxi journey from the railway station. As this holiday starts and finishes at two different points, travelling by train may be the most convenient method of travel. Your holiday finishes at Stoke Lodge Hotel, Stoke Fleming. A transfer to Totnes Railway Station is included in the price of your holiday. This Guided Trail involves walking as a group on well-defined paths, though often in hilly or upland areas. These may be rough and steep in sections and will require a good level of fitness. 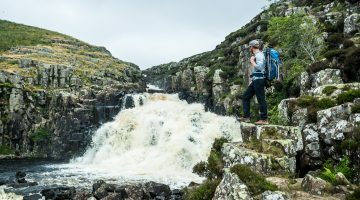 We want you to be confident that you can meet the demands of each walking day and get the most out of your holiday. Please be sure you can manage the mileage and ascent detailed in the daily itineraries. It is important for your own enjoyment, and that of your fellow guests that you can maintain the pace. All holidays at our hotels and country houses are full board, from evening meal on arrival to breakfast on the day of your departure. 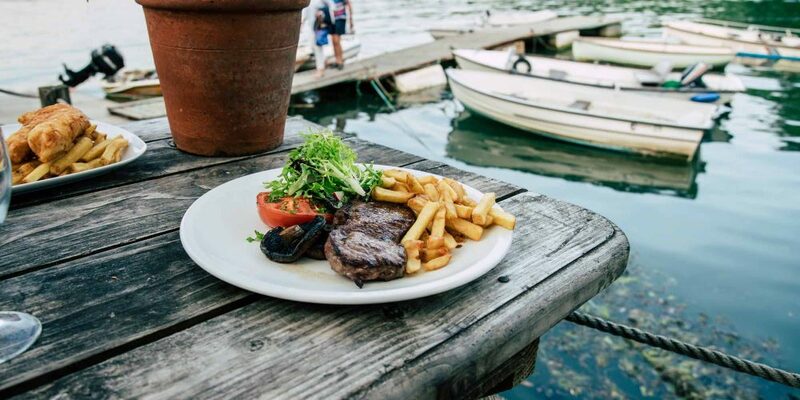 There’s a vegetarian option at all meals and we cater for gluten-free diets. The itinerary offers plenty of opportunities to sample traditional ales and local specialities in the towns and villages en route.